We would like to take this opportunity to thank all the members of staff we had the pleasure of meeting today, in sales and parts dept. You gave us first class friendly service, with a smile on all your faces. We will not hesitate to call again to see you when we need more assistance or purchases. Last week (2 December) we bought a used Bessacarr E760 from you and there were a few minor faults with it. I wish to express my sincere thanks to your colleague Simon for his efforts to rectify these faults. Simon was helpful, kind, courteous and most efficient in rectifying the problems. I will happily recommend his work and his attitude to anyone. He is a credit to your company. I bought a new Lunar Stellar from you in 2007 and have had it regularly serviced by you since. I find that it ticks all the boxes and I have been very pleased with my caravan. After one outing the 12 volt system was lost and the battery went flat. Fortunately this was immediately prior to its annual service and the fault was rectified by your staff. Yesterday, I discovered that the same problem manifested itself again, but I was able to trace the fault and rectify it, but only with excellent support and advice, over the phone, from Chris on your staff. I would like to thank Highbridge Caravan Centre for this support and to thank Chris in particular for his patience, politeness and excellent advice. I am sure that Highbridge Caravans recognises that Chris is a true asset to your organisation. Many thanks again. You will be aware that I bought a new Lunar Stellar from you in 2007 and have had it regularly serviced by you since. I find that it ticks all the boxes and I have been very pleased with my caravan. After one outing the 12 volt system was lost and the battery went flat. Fortunately this was immediately prior to its annual service and the fault was rectified by your staff. Yesterday, I discovered that the same problem manifested itself again, but I was ably to trace the fault and rectify it but only with excellent support and advice, over the phone, from Chris on your staff. 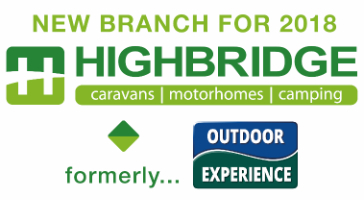 I would like to thank Highbridge Caravan Centre for this support and to thank Chris in particular for his patience, politeness and excellent advice. I am sure that Highbridge Caravans recognises that Chris is a true asset to your organisation. I would like to draw your attention to two members of your staff in the parts department who gave me excelent service with an order for a wing mirror for my Rapido 9096, their names were Simon and Terry, they kept me informed of progress of my order, always returning phone calls promptly. Once again thank you for good service, I will use in in future and pass you on to friends. We called in just on closing time one night when we were passing but were able to look around and did not feel rushed. The sales man who spoke to us and the owner of the company were very friendly and welcoming. So much so we decided to drive up from Devon and purchase a caravan. The salesman (Oliver) was friendly and informative and did not made us feel rushed into choosing, just was around in the background if we had any questions. The paper work completed we left happy. The van was going to be given a full service and a date convienent for us was agreed for collection. When we collected we were greated more like old friends than customers. The service team spent at least an hour explaining how things worked as we were complete novices. We left knowing we could make contact at any time if we had problems setting up etc. On arriving home and taking the van into storage we noticed that one wheel trim was missing. We called and was told to call in and another would be supplied. However the next day a parcel arrived with a brand new pair of wheel trims. We would wholeheartedly recommend this company to anyone. It is rare in this day and age to find a company who obviously puts the customer first and has old fashioned values. Well done to all of you. We would like to thank all the staff at Highbridge for being so professional and helpful through the process of us purchasing our caravan. We also visited their very well stocked accessory shop. We will certainly be back. All the staff in the awnings and shop are always very helpful and polite. I will be back again soon. Just a few words to say that our Flash 28 came home yesterday with no damage to the moulded skirt so the chaps there appear to have solved the problem. We would like to say that we were very impressed with your service on being informed of our problem with the van, and that we feel that you went over and above to resolve the problem prior to our holiday this Friday. Special thanks have to be said to Steve as his concern at our plight and his commitment to resolving the problem was exemplory, hope he had a good holiday. I would like to congratulate you on your excellent web site. I have just written a moaning letter to MMM complaining about poor Motorhome dealers web sites, poor quality photos, not enough photos, lack of vehicle dimensions etc. Yours outshines all the rest I have seen and it really makes me want to come and buy a motorhome from you.